Cottons: Flat and Herringbone Tape Ribbon. Printed with PMS colour matched ink. The prices quoted below are per 100 metre roll and include a 1 colour print. Minimum order is 5 rolls. This is a sticky backed single sided acetate satin ribbon ideal for sticking straight onto packaging. It comes in white, black, crème, navy or red colour only – more colours to follow. 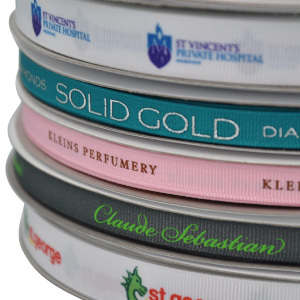 It can be foil stamped in one or multiple colours just like normal satin ribbon. The prices quoted below are per 100 metre roll (min order) and include a 1 colour print. 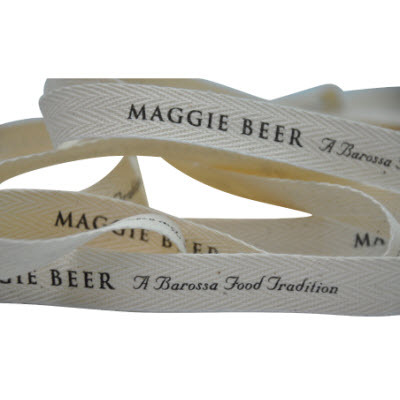 Double Faced Polyester Satin Ribbon is a premium quality ribbon. The prices quoted below are per 100 metre roll (min order). Double sided satin is shiny on both sides and soft like a girl’s hair tie ribbon. It has a great hand feel and is printed on one side only.